← Babes 2 – Winter is Coming! 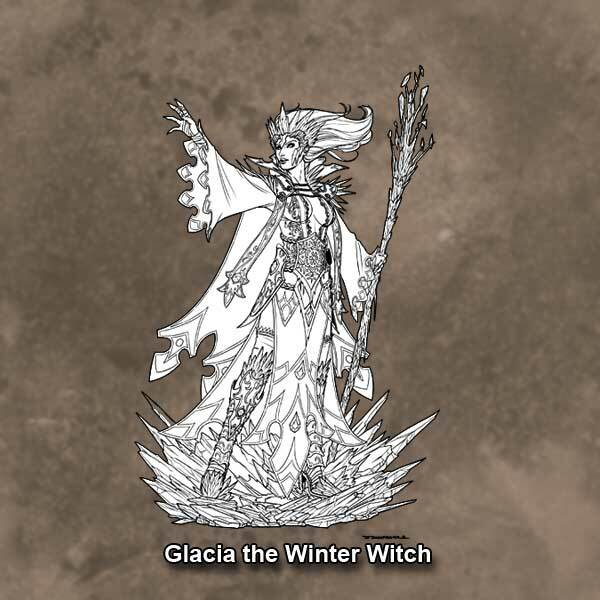 $23,000 – Glacia the Winter Witch UNLOCKED – Thank you! Mistress of the ice and snow, she seeks to rule all within her frigid grasp! Once this goal is reached Glacia will be unlocked as a Babes choice for the Bomb Kit. She will also be available for just $8 each to select her as an optional Add-On reward. We have a very special Relic offered. When we reach $25,000 it will unlock the Relic – Dryad added to the Bomb Kit absolutely FREE! This miniature was sculpted in 2006 and cast in a very limited run to give away as a promotional piece and to sell on the web. The sculpt won 2nd Place in the GenCon Painting Competition – Sculpted Greens category and is offered again here as a special Kickstarter Babes 2 incentive. Take to the Skies with these aerial oriented Babes and Sidekicks. They would make excellent additions as ground crew or characters in pulp or Weird War games. Giorgio Baroni posted another of his great timelapse videos of his painting process on the terrific Qadira art he produced for us. Check it out here.